To be honest I just got throw into a situation with you and I never sat down long enough to think about “us”. We seemed to just be. I don’t think I honestly even liked you very much at first. I spent lots of time with you so got to know you quite a bit better. I still didn’t really like you, but tolerated you. You insisted you were developing strong feelings for me, but I didnt want to let myself even slightly attach to you because you have a wife. We spent more and more time together and you kept telling me to think about our future together and what that would be like. It was making me mad because I couldn’t fantasize about that either because well, for one, you had someone. You badgered me over and over telling me how good we are together and how in sync we are, but I was feeling nothingness and confused. I have had time to think about it now, and no,I’m not in love with you. I never was I realize, and never will be. I grow angrier and angrier with you each passing day. I don’t and won’t look back on “us” with sweet memories. I look back and wonder how the eff did that even happen. We won’t ever be friends again just so you know. Your headgames didn’t really work. I did learn from you just what type of goon to avoid in the future. Erasing you from my mind now.You don’t exist to me anymore. Next story Stupid Sudbury Drivers! Previous story Who does skate sharpening? 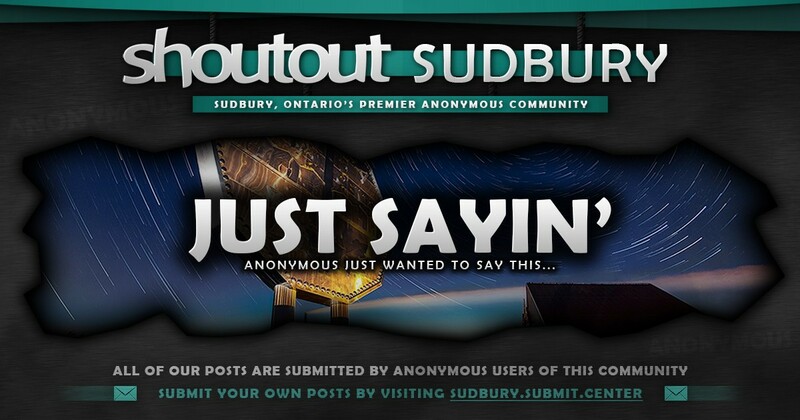 Why does Sudbury seem to have more scorned gay lovers than any other Canadian city?